Island Park Reservoir is located in some of Idaho’s most beautiful and unique country. This 7000 acre reservoir is on U.S. Highway 20, about 30 miles north of Ashton, and only 25 miles west of Yellowstone National Park. 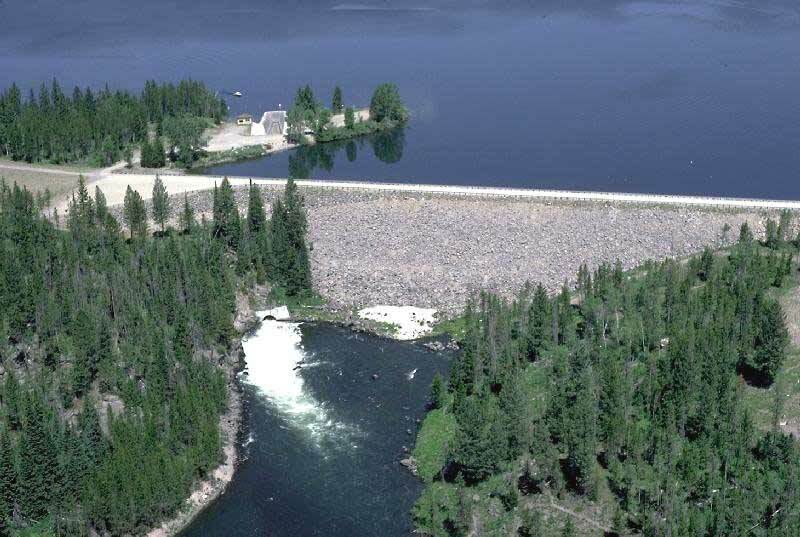 The reservoir was constructed in 1938 as an irrigation storage facility, and has added to the diverse fishing opportunities of the area. Access on the east end of the reservoir near the dam is excellent. Camping facilities, boat ramps and areas for shoreline fishing are all available. West end access is limited to one campground and ramp. Some shoreline fishing is also available in this area. Trout and kokanee provide the base of the Island Park fishery. Rainbow and rainbow/cutthroat hybrids are the most popular for anglers, with kokanee a close second. Brook trout and whitefish round out the game fish populations. Lahontan cutthroat have been stocked to take advantage of the abundant prey base and to provide a future trophy fishery. ISLAND PARK RESERVOIR HAS 5 BOAT LAUNCH SITES. THE RESERVOIR IS POPULAR FOR FISHING IN THE SUMMER AND ICE FISHING IN THE WINTER. WATER SPORTS INCLUDE BOATING, WATER SKIING, WET BIKES AND OF COURSE SWIMMING. In the fall of 1933, the Bureau of Reclamation started their investigation on the Island Park Dam site for the purpose of irrigation water storage on the Snake River west of Pond’s Lodge. The prime contractor for the Island Park Dam was the Max J. Kunney Company who installed the small power plant on the Buffalo River as a pre-construction project enabling them to have electrical power available for the large Island Park Dam project. The construction of the dam came during the depression days and the C.C.C. employed many Idaho people which greatly helped the employment picture during the 1930’s. The spring of 1939 saw the water gauge installed and last-minute clean up of the project site. Upon completion of the Island Park Dam, Charles Pond, owner of Pond’s Lodge, purchased the small Buffalo power plant from which he provided the first hydro-electric power used in Island Park’s resort businesses. Prior to this time all electricity at Pond’s was provided by small, portable, gasoline-powered generator systems. Mack’s Inn, other establishments, and ranches all continued with private systems until 1947 at which time R.E.A. established a power line from Ashton to West Yellowstone. This provided the first economical electricity to Island Park’s resorts and private residences. It must be said at this point, that the Island Park dam has been an asset to the valley farmers and an invaluable control of spring run-off, but it has also had some sad consequences. There was great sadness and great up-rooting of ranches and homes as the beautiful Snake River and Shotgun Valley were flooded by the reservoir waters. Nevertheless, the flood control benefits and the recreational opportunities created by the Island Park reservoir have been positive factors these past 50 years. It must be noted, at this writing that a hydro-electric project is approved for the Island Park Dam in the near future.